When you need an excavator to take on a big job without consuming a lot of space, you can confidently turn to John Deere for a solution. 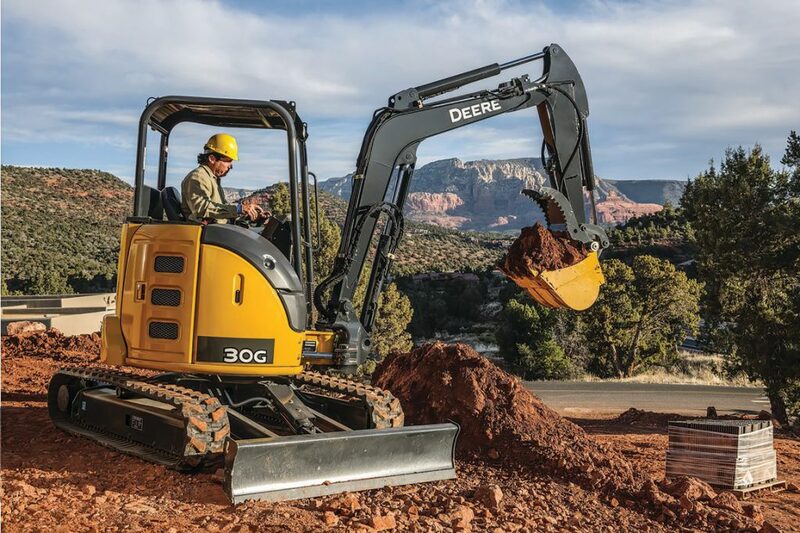 The John Deere 30G is a compact excavator that has everything you need for the task at hand. G-Series excavators are extremely maneuverable and pack a ton of force. Let’s take a look at the highlights of the John Deere 30G. The John Deere 30G is designed to fit customers’ needs when they want an excavator that isn’t too large or too small for the job at hand. It fills the gap between the 26G and 35G options from John Deere, delivering impressive bucket force, arm force, and breakout force with its size. It is convenient to use for everything from site-development to landscaping tasks. The workspace of the John Deere 30G is optimized for comfort – no cramped corners. The operator station has a wide entryway, making it easy to exit and enter the excavator. The cab’s front glass is expansive, meaning visibility is not compromised. The automatic, high-velocity bi-level climate-control system with adjustable louvers also keeps the glass clear for maximum visibility. Track speeds are designed to automatically slow to low whenever the John Deere 30G is handling a heavy load. This means that the operator does not have to activate anything manually, giving him or her one less thing to worry about. In addition, no pedal or operator activation is required for high-speed travel. The John Deere 30G has a wet-disc swing brake, which makes for long-term, maintenance-free performance. Its O-ring face-seal hydraulic fittings reduce the potential for costly leaks and downtime, while steel hydraulic lines are clamped securely. With a box-constructed X-frame and track frames, the John Deere 30G has a stable platform that reduces dirt build-up over time. A number of different attachments work with the John Deere 30G. Operators can utilize a backfill blade, for instance, for more stability on uneven terrain. Worksite Pro augers can be used with the John Deere 30G, in addition to a wide array of buckets to tackle different tasks on location. Hydraulic hammers can be used for quarry or trench work as well. If you have any questions on John Deere 30G or any of its features, contact your local John Deere dealer.